Whenever one is mentioned, the other is mentioned as well – the duo of Jason McCourty and Devin McCourty make up the McCourty twin brothers who both play for the New England Patriots in the National Football League (NFL). Our attention here will, however, be mostly on Jason as we take a broader look into his family life, find out who his wife is, in addition to listing some facts we gathered about the NFL star. This notwithstanding, his brother Devin will hardly ever be out of the picture so let’s take a look at their background. Jason was born with his twin brother on August 13, 1987, in Nyack, New York, to Calvin McCourty and Phyllis Harrell. The brothers were raised by their parents who sent them to Saint Joseph Regional located in Montvale, New Jersey where they both played football. Afterwards, the McCourtys enrolled at Rutgers University and as usual, they both played for their varsity team as cornerbacks and Devin occasionally played as a free safety. He was picked by the Tennessee Titans in the 2009 NFL Draft where he played for the greater part of his career before getting signed by the New England Patriots from the Cleveland Browns. Aside from his twin brother, a certain Larry White is also listed as his siblings but not much information has been revealed about who he is and what he does. Nevertheless, seeing the exploits his brothers are making in the NFL, Larry definitely must be proud of them and the honour they bring to their family name. Jason’s well-known brother is Devin McCourty who also plays in the NFL with the New England Patriots, the same team with his brother. In like manner, he schooled at Saint Joseph Regional High School in Montvale, New Jersey, where he played football as a cornerback and free safety, posting impressive stats. After high school, Devin began playing for the Rutgers Scarlet Knights of Rutgers University beginning in 2005 till he graduated in 2009. From his freshman year till he graduated with a bachelor’s degree in Sociology in 2009, he played all regular season games and what with his performance earned a listing on the All-Big East Conference academic selection (first and second season) and the All-Big East first team in 2009. The Nyack, New York-born free safety entered the NFL as a first-round pick and 27th overall selection of the New England Patriots in the 2010 NFL Draft. He has remained with the team since then, giving an account of his money’s worth. When Devin became a free agent in 2015, the Patriots offered him a 5-year contract worth $47.5 million which had $28.5 million guaranteed and a signing bonus of $15 million. Jason McCourty teamed up with his brother as a Patriot on March 15, 2018, following a trade from his last team the Cleveland Browns for a 2018 seventh-round pick for New England’s 2018 sixth-round pick. On his arrival at the Gillette Stadium Foxborough, Massachusetts, Jason played all 16 regular season games in 2018, starting 12. It is expected that the brothers will set many records as Patriots, having been united in one team for the first time in their careers. Melissa McCourty is the wife of Jason McCourty. The duo began dating a long time ago after meeting in college when Jason was a sophomore. They got love-struck and in 2014, took their marital vows. 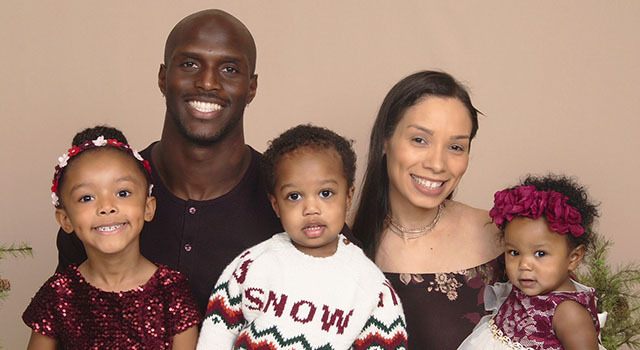 Today, they are parents to three lovely children Liana McCourty (born in 2013), Kaiden McCourty (born in 2016) and Kai McCourty the youngest who was born in 2017. 1. Jason’s brother Devin McCourty was picked during the 2010 NFL Draft in the first round (27th overall) by the New England Patriots, while Jason himself entered the NFL as a sixth round (203rd overall) pick in the 2009 NFL Draft after being selected by the Tennessee Titans. 2. They are among a set of 13 twins in NFL history and constitute one of 5 that are still active in the sports. One of the most famous is the Griffin brothers (Shaquill Griffin and Shaquem Griffin) and perhaps in the future, we might see the likes of Georgia Tech Lance and Lawrence Austin. 3. The NFL cornerback stands at a height 5 feet 11 inches or 1.80m and weighs 88kg or 194lbs. 4. In the course of his career, Jason has played in teams like Tennessee Titans for 8 seasons, spanning from 2009 to 2016. His next team became the Cleveland Browns which then traded him to the New England Patriots where he reunited with his twin brother. 5. Jason McCourty has amassed a net worth of $8 million playing in the NFL. 6. He met his wife through a mutual friend while they were in college and 5 years later, he proposed to her in front of their family and friends. 7. The couple had a Grecian-inspired wedding at Nashville’s Parthenon with the colours of the day being white, gold and cream.